As your family dentist in Seaside, it’s our duty at Seaside Family Dental to protect the long-term oral and overall health of all of our patients. The health of your teeth and gums help older adults maintain good physical health, and – according to the results of a new study – improved mental health. The study – which examined over 60,000 adults 65 and older – found that seniors who suffered from significant tooth loss were less functional – both mentally and physically – when compared to seniors who had lost fewer teeth. The study was recently published in the Journal of the American Geriatrics Society. This most recent study wasn’t the first to find a link between mental decline and tooth loss. Researchers at Boston University’s Henry M. Goldman School of Dental Medicine examined veterans living throughout the greater Boston area. The researchers found that the veteran had an 8 to 10 percent higher risk of performing poorly on cognitive tests for each tooth lost per decade. Researchers involved in the study believe that inflammation could be a possible cause, nothing that other studies found higher levels of inflammation marketing in patients with Alzheimer’s. “Periodontal disease and caries (tooth decay) are infectious diseases that introduce inflammatory proteins into the blood,” stated lead researcher Professor Elizabeth Krall Kaye. Additionally, a study conducted by researchers at the University College London found that the memory and walking speed of seniors who had lost all of their teeth declined more rapidly when compared to seniors who still maintained some of their natural teeth. The results of these studies only help to reaffirm that growing amount of evidence that suggests an individual’s oral health plays a significant role in determining his or her overall health. In addition to causing significantly mental decline, research has found compelling links between poor oral health and a number of significant chronic illnesses. Studies have found that individuals who suffer from gum disease and tooth decay have a significantly higher risk of cardiovascular disease, stroke, diabetes, arthritis, obesity, and even some forms of cancer. Fortunatley, you can help lower your risk of these disease while improving your oral health by following three simple steps. Brush twice daily. Brushing at least twice a day for 2 minutes a time helps to remove harmful oral bacteria from the surface of your teeth and along the gum line. Failing to remove these substances from your mouth significantly increase your risk of oral disease. Floss daily. Flossing helps to remove plaque and food from areas of your mouth a toothbrush cannot reach – between your teeth and below the gum line. 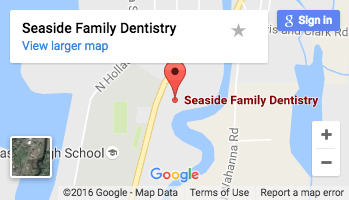 Schedule regular dental visits your family dentist in Seaside. Regular exams and checkups provide our team with the opportunity to spot the signs of dental disease early on while still easily treatable. That’s it! Follow these simple and you’ll significantly improve your oral health while lowering your risk of future oral and overall health problems.